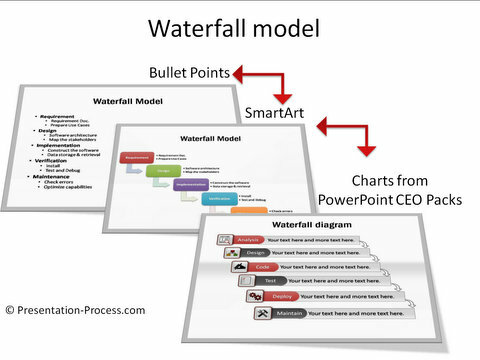 This Waterfall Model Video Tutorial shows how to use the step down process diagrams in Smartart to create a waterfall. The tutorial uses PowerPoint 2013. Here is an example of how the boring bullet point slide in the video is made over into a useful Smartart and from a Smartart diagram, more creative options to present the same idea.